AIDS Therapies and Vaccines - used, first, body, Treating the Virus, Developing Vaccines, What Is AIDS? Public awareness and understanding of Acquired Immune Deficiency Syndrome (AIDS) and Human Immune Deficiency Virus (HIV) has increased since the first AIDS cases were diagnosed in the 1980s. There are several reasons for this expanded understanding. The development of promising therapies and vaccines has given hope to infected individuals, while education—from public service announcements to classroom discussions—has helped decrease the spread of AIDS in certain populations. 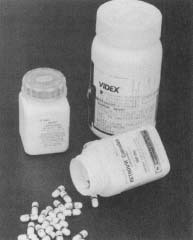 Three of the drugs commonly used to treat AIDS are DDC (left), DDI (right), and AZT (front). There are several reasons why AIDS is difficult to treat. HIV is a retrovirus (a virus made up of ribonucleic acids, or RNA, instead of deoxyribonucleic acids, or DNA). All retroviruses use a special enzyme, called reverse transcriptase, to copy their genetic material directly into a host cell. HIV is lytic, meaning that it kills the cells it invades. The virus can then become inactive for long periods of time. Researchers are trying to learn how and why the virus reactivates. Treatment must either kill the virus or stop it from multiplying. The ideal treatment would kill the virus without harming the HIV host cells. Developing such an antiviral drug is extremely difficult, because viruses use a cell's own genetic machinery to reproduce. This makes it hard for scientists to distinguish between viral and host cell protein molecules. In 1984 scientists began testing more than 300 drugs to learn their effectiveness against HIV. The researchers knew that a good drug had to be able to interrupt the virus life cycle at any one of several stages. A drug called azidothymidine (AZT) showed special promise. AZT does not cure or prevent AIDS, but it can slow down the progress of the disease, especially when used with other treatments. AZT works by preventing reverse transcriptase from reproducing HIV in the host cell's DNA. In 1993 the effectiveness of AZT was examined in a joint French and British study. The study questioned the practice of giving AZT to patients who have the HIV virus, but exhibit no symptoms. There are currently many therapies at different phases of development and testing. Some antiviral substances, including interferons, have been effective in preventing the virus from budding. Fewer buds mean less virus to infect other cells. The drugs Dextran sulfate and soluble CD4 stop the virus from attaching to the host cell. Other drugs interfere with viral replication. AIDS is a progressive disease with many symptoms. These symptoms, which can take years to develop, include severe weight loss, bleeding, pneumonia, and skin lesions (sores). Many AIDS patients are infected by Pneumocystis carinii (PCP), a condition usually found in people whose immune systems are not functioning properly, and Kaposi's sarcoma, a malignant condition characterized by pink or purple flat or raised blotches appearing under the skin. In October, 1992, the Centers for Disease Control proposed a new definition of AIDS that included three new illnesses, including invasive cancer of the cervix, bacterial pneumonia, and pulmonary tuberculosis. Therapies are used by people already infected with the virus. A cure or vaccine to prevent the disease, though, is the ultimate goal. Vaccination is the simplest, safest, and most effective way to prevent infectious disease. Researchers have yet to develop an effective vaccine against HIV for several reasons. The ability of the virus to hide in host cells makes it difficult for the body's antibodies (disease fighting cells) to find the virus and attack it. The HIV virus also mutates or changes its genetic composition very rapidly. To understand how hard it is to produce a vaccine against HIV, consider the rhinovirus. This virus, which causes the common cold, also mutates rapidly. Because of this mutation, no vaccine exists to prevent colds. Because HIV is a fatal infection, the need for effective treatments is imperative. Scientists from various countries are working together to develop a vaccine to prevent the transmission of HIV. This cooperation makes it much more likely that researchers will succeed in producing a vaccine against HIV.